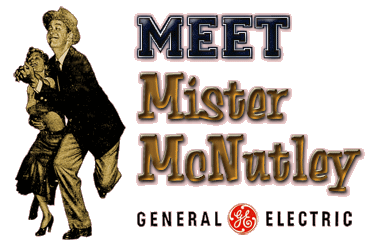 General Electric tended to emphasize the slapstick nature of the early broadcasts of Meet Mr. McNutley over both Radio and Television throughout their 1953 and 1954 ad campaigns promoting the program. G.E. used Meet Mr. McNutley to roll out their Black-Daylite, high-contrast aluminum picture tubes for 1953. The 1950s were the waning decade of the Golden Age of Radio, with Television the new darling of the masses, post-World War II prosperity bringing more television sets into homes, and Television competing head to head with Radio for advertising dollars on an exponential scale. From the 1930s through the mid-1940s, television receivers were predominantly a prestige symbol of affluent. The post-War retooling of hundreds of electronics giants put Television in the popular spotlight for the first time in its two-decade history. All four of the exemplars above were slated for spin offs into Television of the era, but it was only Our Miss Brooks, Meet Mr. McNutley, and The Halls of Ivy that successfully made the transition. Our Miss Brooks was by far the more successful of the three, but Meet Mr. McNutley--later renamed The Ray Milland Show and Meet Mr. McNulty for Season Two of the Television series--acquitted itself well over both Radio and Television, as did The Halls of Ivy. 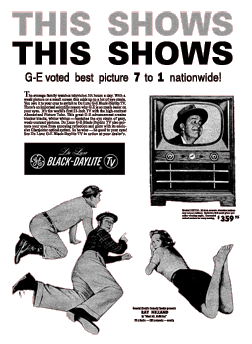 The era of the early to mid-1950s also ushered in several 'simulcasts'--Radio and Television programming aired over both Radio and Television concurrently. Some examples were the long-running The Voice of Firestone and Meet the Press, Martin Kane Private Detective, and Meet Mr. McNutley, among several others. Even more Radio programming of the era found its way to both Radio and Television, airing simultaneously, while perhaps not on the same night, nor employing the same scripts or casts. Examples were Dragnet, Hopalong Cassidy, Hallmark Hall of Fame, Have Gun Will Travel, The Lone Ranger, The Life of Riley, Our Miss Brooks, Richard Diamond Private Detective and Dangerous Assignment, among many others. Indeed, in a few instances, an airing Television production subsequently moved to concurrent Radio broadcasts as well during the era. In several instances the dual programming gambit worked very successfully. In most instances however, the appearance of a Television production of a running Radio program generally marked the beginning of the end of the Radio production. 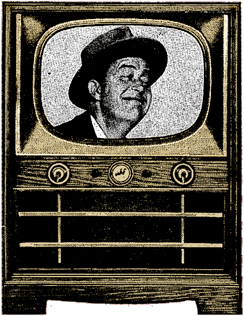 General Electric and CBS brought Meet Mr. McNutley to the air over both Radio and Television on September 17, 1953 as The General Electric Comedy Theater presents Meet Mr. McNutley. One might well surmise from the General Electric Comedy Theatre attribution that G.E. intended to mount other similar situation comedy productions under the same vehicle. 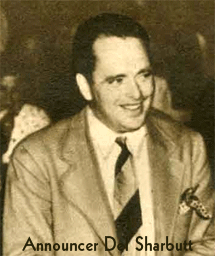 While initially promoted as a 'simulcast' production over both Radio and Television, the Radio and Television productions of Meet Mr. McNutley did indeed air on the same Thursday evenings. But the two, 30-minute productions usually aired an hour apart from each other, on the hour, depending on the market and geographic location. Nor is it currently apparent that the same scripts aired over both Radio and Television on any given Thursday evening. We can understand the original intent of mounting the production in this manner, but it would seem more logical for CBS to have aired differing scripts/productions on different weeks. Clearly if a household possessing both a Radio and Television was hearing or watching the same essential script over either their Radio or Television there'd be little incentive to hear or view the corresponding production on the same evening. The plots' respective denouements and gags would clearly lose their effect if heard and viewed back to back--even an hour apart. From this we can only conclude that any characterization of the productions as 'simulcast' is somewhat inaccurate. It was also apparent that the scripts behind the respective Radio and Television plots for each production varied a great deal--by design. The contemporary reviews and critiques of the production tend to bear this out, as well as contemporaneous interviews with both Ray Milland and Phyllis Avery. The initial Television run was initially panned for the slapstick nature of many of the gags. Reviewers generally found the Radio rendition of the same plot less over the top, in their view. And indeed, some of the more 'visual' slapstick gags wouldn't have translated well over a Radio script in any case. The productions over both Radio and Television were supported by some of the finest Radio, Film and Television talent of the era, including Verna Felton in the Radio role of Dean Josephine Bradley, Irene Tedrow, Elvia Allman, Harry Bartell, Herb Vigran, Frank Nelson, Barney Phillips, Joan Banks, Alan Reed and Mary Jane Croft. The chemistry between Ray Milland and Phyllis Avery, both Film stars in their own right, translated well over both Radio and Television. The joint production was set at Lynnhaven College for Women. Oscar-winner Ray Milland appeared as Raymond McNutley, the somewhat absent-minded Professor of English at Lynnhaven. Phyllis Avery appeared as his long-suffering wife, Peggy. As mentioned above, Radio, Film and Television veteran Verna Felton appeared as Dean of Women, Josephine Bradley, in the Radio production [Minverva Urecal in the Television production]. Other recurring characters were 'Pop' Wallace, the college's Caretaker and Gordon Jones as Pete 'Petey' Thompson. The first season of Meet Mr. McNutley proved to be its last over Radio. The second season of Meet Mr. McNutley, rebranded The Ray Milland Show and Meet Mr. McNulty, aired exclusively over Televsion. Production of the first season's episodes was completed in April 1954, allowing Ray Milland to depart for a much needed vacation in Europe. The remaining First Season productions aired through June 10, 1954 over Radio and June 17, 1954 over Television. March 10, 1954 newspaper article notes the departure of Ray Milland for Europe upon completion of filming of Meet Mr. McNutley in April 1954. RadioGOLDINdex, Hickerson Guide, contributor Gary Marsa, jjonz.us/RadioLogs. The most helpful provenances were the log of the radioGOLDINdex, newspaper listings and the log of Gary Marsa. 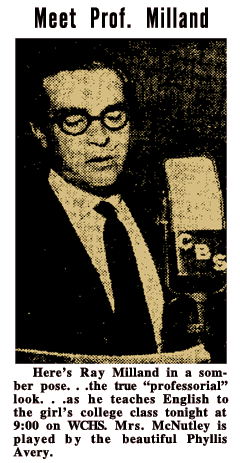 Of the circulating exemplars of Meet Mr. McNutley, only one appears to have announced its title--'The Mink Coat," alleged to have aired on May 27, 1954. All other circulating titles appear to be anecdotal--or derived from their equally anecdotal corresponding Television episode titles. The Television episodes for Season One of Meet Mr. McNutley apparently never displayed their titles in either the opening or closing credits. Absent original scripts for either the Radio or Television productions, we must conclude that only a handful of the Season One productions bear an announced title of one form or another. The Jigger Shop, The Ice Cream Parlor, and The Ice Cream Treat are all the same episode. The Mink Coat, Dean Bradley's Fur Coat, and The Fur Coat - Jingle Contest are all the same episode. In the CBS rendition, Del Sharbutt announces the episode as "The Mink Coat." 8:00 p.m.--Meet Mr. McNutley (WKOW): new series starring Ray Milland as absent-minded professor. 8:00 p.m.--Meet Mr. McNutley (WKOW): "The Perfect Marriage." Meet Mr. McNutley(WGBS 9 )“The Perfect Marriage” with Ray Milland starring as Prof. Ray McNutley. He does a little research on his own book, trying to find out what constitutes a perfect marriage. Ray Milland offers assistance to an attractive neighbors but gets into hot water when the lady’s husband comes home in “Perfect Marriage” on Meet Mr. McNutley at 9 on WPAY-CBS. 8:00 p.m.--Meet Mr. McNutley (WKOW): forgetfulness involves new teacher with police. Meet Mr. McNutley(WGBS 9 )Ray Milland, as Professor McNutley, agrees to invite a new teacher to stay with him and his wife until she can find a permanent home. 8:00 p.m.--Meet Mr. McNutley (WKOW): Ray Milland as professor who overlooks wife's anniversary. 8:00 p.m.--Meet Mr. McNutley (WKOW): a forgotten birthday. Mr. McNutley(WGBS 9 )Ray Milland as Professor McNutley finds a date circled on his calendar and gets into a series of mishaps in trying to figure out what it means. 8:00 p.m.--Mr. McNulty (WKOW): professor tries to prove he's not a cornball. 8:00 p.m.--Meet Mr. McNutley (WKOW): professor and wife revisit scenes of courtship. TELEVISION HIGHLIGHT: 8WTOP-TV. Dean Bradley drops in on Professor McNutley to help him paint the kitchen. 8:00 p.m.--Meet Mr. McNutley (WKOW): poetry starts imagination working overtime. Mr. McNutley(WGBS 9 )A visiting teenage niece and her young suitor, (who seems to have a split personality) create considerable consternation in the household of “Professor McNutley” (Ray Milland). 53-11-19 Wisconsin State Journal - 8:00 p.m.--Meet Mr. McNutley (WKOW): professor gets wanderlust. Meet Mr. McNutley(WGBS 9) Professor McNutley (Ray Milland) tries to change his job. Professor McNutley, gets wanderlust and makes plans for a change in jobs, only to be overcome with nostalgia and remorse when his old friends give him a farewell party on "Meet Mr. McNutley," KCBS at 6 o'clock. 53-11-26 Wisconsin State Journal - 8:00 p.m.--Mr. McNutley (WKOW): professor goes party for students. 53-12-03 Wisconsin State Journal - 8:00 p.m.--Mr. McNutley (WKOW): professor arrested as bank robber. Meet Mr. McNutley(WGBS 9)Ray Milland as Professor McNutley, borrows the wrong automobile and gets arrested as a bank robber. 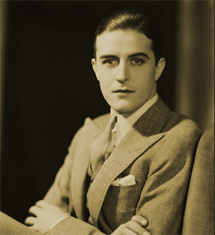 9:00Ray Milland borrows car and lands in jail on Meet Mr. McNutley showWJR.
. . . (8:00 p. m.) A French exchange student visiting the McNutley's picks up the American way too fast on General Electric's "Meet Mr. McNutley." 53-12-17 Wisconsin State Journal - 8:00 p.m.--Mr. McNutley (WKOW): Uncle Wilbur causes complications. 53-12-24 Wisconsin State Journal - 8:00 p.m.--Mr. McNutley (WKOW): Christmas for stranded French student. Meet Mr. McNutley(WGBS 9) Prof. Ray McNutley and his wife Peggy, cement international relations when they give a stranded French exchange student and her family a merry Christmas. 9:00Ray Milland, as Mr. McNutley, gives a stranded French student a wonderful holidayWJR. 9WTOP. Mr. McNutley gives a stranded French student and her family a Merry Christmas. 8:00 p.m.--Mr. McNutley (WKOW): nostalgia wins over change. Ray Milland, as Prof. McNutley, has his hands full when he entertains a youthful house guest and tries to ruin some elopement plans on KNX at 6 p.m.
WBTV--The Dean of Lynnhaven College for Women, "who usually "wears the pants" in the affairs of the school, goes off for a four-day trip and leaves In charge  but who else?  Professor McNutley. This is the situation in tonight's "Meet Mr. McNutley" story, which finds the full responsibility for 263 girls on the slim but capable shoulders of Ray Milland. It's a precarious time to be Acting Dean, thinks Milland. as Ray McNutley, for  on top of everything else  it's initiation week for the sororities. Phyllis Avery is seen as the wife of McNutley in the comedy series, telecast each Thursday evening at 10 o'clock. 8:00 p.m.--Meet Mr. McNutley (WKOW): retirement plan. 8:00 p.m.--Mr. McNutley (WKOW): old flame comes to town. 8:00 p.m.--Mr. McNutley (WKOW): professor dons old army uniforn, starts a rumor. Professor McNutley has an argument with Dean Bradley and when he dons his old Army uniform for a reunion word spreads that he has re-enlisted. Ray Milland has the starring role at 9 on WPAY-CBS. 8:00 p.m.--Meet Mr. McNutley (WKOW): professor, bucking for raise, finds rare paper for dean. Ray Milland stars as the professor in a misadventure when he comes face to face with Dean Bradleya lady with all the charm of a brigadier generalon “Meet Mr. McNutley” at 9 tonight on WPAY-CBS. gets arrested as a bank robber. Birthplace: Neath, Glamorgan, Wales, U.K.
Prof. Ray McNutley, slightly pixilated, charming central figure of the CBS Television comedy hit, "Meet Mr. McNutley," is a far cry from the tragic alcoholic in "The Lost Weekend." But Ray Milland, who has created both parts, is the kind of actor whose extreme sensitivity to people and wide experience makes possible this unusual versatility. Milland is seen on KXLY-TV. He was born in Neath, Wales, as Reginald Truscott-James, son of a steel mill superintendent. After public school and King's College at Cardiff, he entered the Royal Horse Guards of the King's Household Cavalry. His four years in this elite organization resulted in honors as a horseman and marksman. He was also second best boxer. After completing his Army career, he toured Europe--by foot, bicycle, boat and any other mode of conveyance available. His debut in motion pictures came about when his travels were interrupted by lack of funds, appeared in English films which made much of his ability at expert gun play. In 1931, MGM brought him to Hollywood for "Polly of the Circus," followed by "Bought" with Constance Bennett at Warner Brothers. Neither picture impressed the public, but he did meet and marry a lovely non-professional, Muriel Webber. In 1934, Milland came to the attention of Paramount, and was launched on a series of sophisticated comedies that brought him great success. Since then, Milland has become an American citizen and has appeared in more than 65 pictures, including the memorable "Lost Weekend," which won the International Grand Prize at the Cannes Film Festival as well as Academy Award honors in 1946. Milland's zest for adventure and travel runs high. He has owned a series of boats, the last being a twin-engine cabin cruiser. In preparation is a new home at Balboa which has, he says, "the biggest dock in the world because there's no boat in it--yet." In the summer he spends much of his time fishing. In the winter he goes to the mountains for skiing. The actor is six feet one-and-a-half inches tall and weighs 185 pounds. The Millands have a 13-year-old-son, Daniel David, who has already caught up with his father in height. The little girl, Victoria, born in 1945, gives promise of being as much of a beauty as her mother. The family lives in a year-old house on one of Beverly Hill's quieter streets.